It seems like two days have gone by since I last posted this morning. After checking out of the Holiday Inn, the hotel concierge called me a cab and told him where I wanted to go. 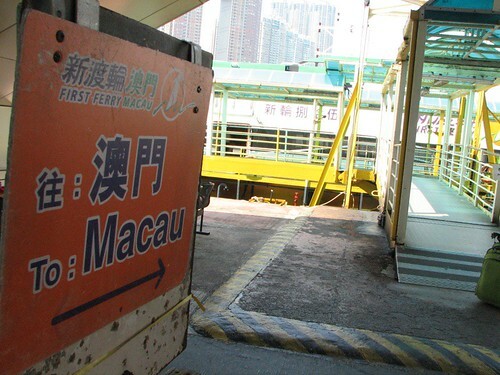 My original plan of going to the ShunTak ferry terminal proved to be incorrect (somewhat), First Ferry To Macau operates out of the Central Ferry Station which is right near Kowloon. The cab ride was HK$30. Speaking of cabs, the taxi's here are all red and white Toyota's that look like a Volvo. Just like in Japan, the doors open and close automatically, you don't have to open or slam them shut... just walk away. The cab drivers here don't help you with your bags... they don't even get out of the car to pretend they're helping you... I guess this is why tipping isn't a big thing here. The custom is to round up to the nearest dollar and thats it. "Keep the change Mac." The Central Ferry Station in Hong Kong is a medium sized shopping mall on multiple levels. Tickets were about HK$130 (US$18) and the ride took about an hour. There were barf bags but I didn't hear or see anyone using them (rats!). The guy sitting across the aisle from me belched continuously throughout the ferry trip. Not burping, but belching... 'Booger' style. Wraaaaaaaaaaaaaoaoouuuuuuugh. The two guys sitting behind me decided to accompany this Concerto for Burpestra by providing a finely tuned snoreful counterpoint. Bach, Brahams and Bartok - the three great composers of contrapuntal contraptions would have been quite proud of this display. The Ferry terminal was quite crowded, fortunately they opened up a new aisle (of smiles!) and I jumped from 56th in line to 2nd. Killer. I handed the guy my passport and he opened it, looked at the photo, looked at me, looked back at the photo, tilted his head, looked back at me. "I got a hair cut," I said. He cracked what, for a customs agent, could possibly be construed as a smile, stamped my documents and sent me on my way. Until about a month ago, I had a beard and 4 feet of big gnarly natty dreadlocks hanging from my head. Both are in full bloom in my circa 2002 passport photo. Passport: Damian 'Jr. Gong' Marley, in person: Pee Wee Herman. He's the first immigration officer to do the double take that I've been expecting. Upon emerging from customs, a bunch of taxi drivers immediately gravitated towards me like flies on an ice cream sundae trying to get a fare. There is no reason to get a taxi from the ferry terminal if you're staying at one of the major casino hotels, hotel shuttles owned by the specific properties are parked right outside. There was a guy walking through the throng of people exiting the terminal with a red "Wynn Macau - Free Shuttle" sign that sloped at the top of it just like the building does. Unfortunately, he got away before I could get a photo of it. I did get some photos of the other shuttle buses, which I'll post later.